The Coleman brand is well-known for its quality products. 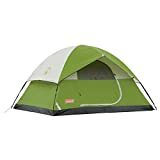 The Sundome 4 Person Tent is no exception. We loved the extra attentions to details that campers really appreciate. Their tents are well made with high-quality materials that can stand up to the elements. The manufacturer also includes patented technologies and features that make it a leader in the industry. 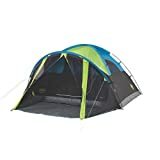 The Sundome 4 Person Tent was super easy to set up with plenty of room for people and gear. Fantastic ventilation with mesh panels on the ceiling for stargazing on clear nights and a floor vent in the rear of the tent to keep air moving. Lots of extra features including a ring on the ceiling to hang a light and an opening in the door to run an extension cord inside. The Instant Tent has pre-attached poles so that setup is quick and simple even for one person. Sturdy design holds up in windy conditions. The built-in rainfly, inverted seams, and welded floors keep you warm and dry. Our third and fourth choices also had those little things that we love to see in tents. But not everyone may agree on how useful they are when camping. We settled on two with some unique features that make them worth a look. Dark room technology keeps out sunlight so that you can sleep in when you want. Large screen room extends living space an extra four feet. Full rainfly keeps both the tent and the vestibule dry. Your tent is the most important purchase you’ll make for camping. It’ll make the difference between a fun getaway or a miserable outing. Tents come in a variety of styles, types, and designs. You’ll also find a lot of extra features. It’s a big investment, so it makes sense to know what to look for to choose the best one for you and your group. We’ll guide you through the features you should consider when purchasing a new tent. Comfort and durability are primary factors. The last thing you want is to realize you’ve picked the wrong one when you’re at your campsite. Ventilation is another major consideration especially if you camp during the summer months. 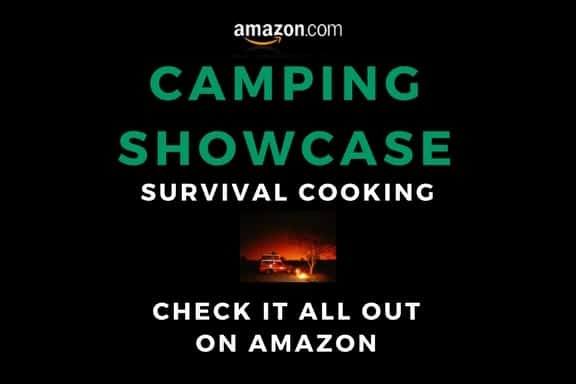 A lot depends on the type of camping you typically do. The group that backpacks to a site will have different needs than for someone who parks next to his tent. Keep these things in mind when you research one for your needs. Tent occupancy is a relative figure. When a manufacturers give a capacity number, they usually state a number based on the number of individuals sleeping side-by-side. It doesn’t always take into account what else you’ll have in the tent too. And it may not consider the occupants. Remember, the figure is for the average size person. If the family dog shares sleeping quarters, you’ll have to count him as an extra person. Also, think about how much space you need to sleep comfortably. That includes enough room to get out to use the restroom without disturbing others. There may also be differences between manufacturers for what the capacity of a 4 man tent. Next, consider the type of tent you’d prefer, keeping the capacity in mind as well. Each kind has advantages and disadvantages that could influence your choice. Let’s review the most popular ones. The dome tent has a lot going for it. It is often easier to set up too. The rounded shape provides excellent protection against the wind which will flow over the top of it. Depending on the material, they may be lighter in weight. They often include mesh panels with noseeum netting for better ventilation. The disadvantage is that you’ll lose some area that won’t have the headroom for standing. It’s the kind of thing that becomes evident quickly when you’re trying to stand up to dress. The maximum height given in the specs is in the center, not the edges. At this size, they have enough room to accommodate an airbed. Set-up for an A-frame tent tends to be more involved because it has vertical walls and a pitched roof. They are often heavier as a result. However, there won’t be any issues with standing in the tent as long as you select one with an adequate height. You’ll have the maximum amount of space in a 4 person tent. The disadvantage is that the wind will hit it full force. That may cause the walls to shake during a stormy night. That could be a problem for light sleepers. Ventilation can sometimes be a problem if there aren’t enough windows or doors. Tents vary in the season for which they will provide adequate shelter. 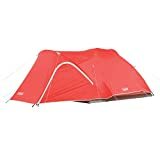 The best choice will match the times of the year you usually go camping and provide the most comfortable sleeping conditions. If you’re a fair weather camper, a 3-season tent is a smart choice. These lightweight tents will keep you dry and cool during the warm summer nights while providing welcome ventilation. These models often have one or more mesh panels to help with air flow. A 3-season extended tent allows you to keep the camping season going into spring or fall. They offer extra support to handle spring rains or early snowfalls. They may have fewer mesh areas to keep you warm on chilly nights. 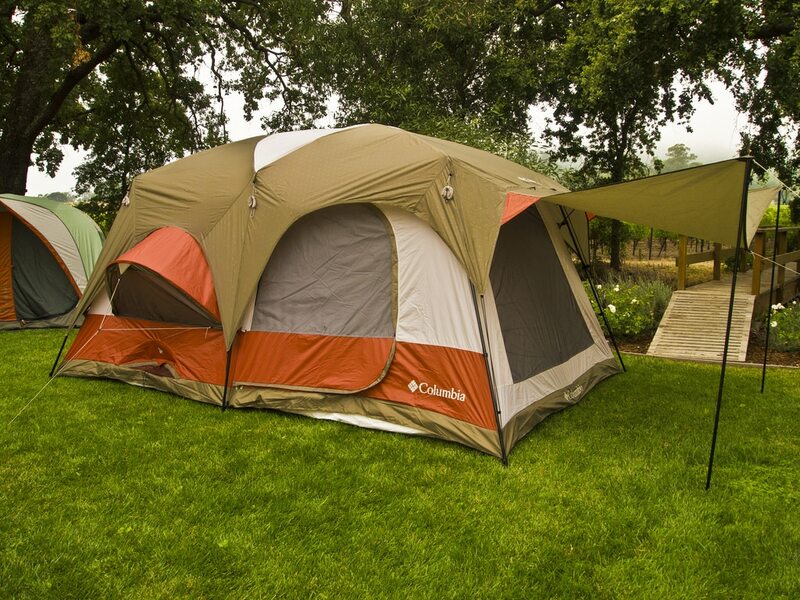 Four-season tents are the top of the line for sturdy tents. They are sturdy and durable to handle the heavy snowfalls and rain storms. They are heavier than the other types to keep everyone toasty warm and safe. They are typically dome tents. A tent will often include other features that can affect how comfortable they are. Again, consider the type of camping that you do to determine which ones will make a better choice for you. The type and construction of the tent poles, for example, can play a major role in the setup of the tent too. You’ll find tent poles in a variety of materials including steel, fiberglass, and aluminum. The difference will affect how easy a tent is to set up and its overall weight. Generally, aluminum offers a sturdier option that is a good balance between the two. A rainfly will cover the roof of your tent to protect the inside from rain and moisture. They are usually separate accessories so that you can take it off for extra ventilation on clear nights. Likewise, they can help retain the warmth inside the tent when it gets cool outside. 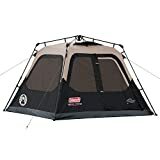 You’ll find tents with either partial rainflies that cover the roof only or full ones that will cover the entire tent and vestibule if there is one. Your tent may include a vestibule which will add to the area of usable space. It’s typically an add-on feature that you can use to store your gear or to change out of wet or muddy shoes. For that reason alone, we prefer a tent that includes at least one. A vestibule will also add to the living space of the tent. The size varies. Sometimes, you’ll see small ones that can provide shelter for a camp stool or a suitcase. Others are entire extra rooms. We highly recommend that you do a trial run with setting up your tent with its rainfly before you travel. It’s far easier to do it during the day than with evening approaching when the mosquitoes are out. It’s an excellent time to find out what you can do to make the process easier. Also, take it down and place it in its carrying bag. It’s the best way to make sure things go smoothly.